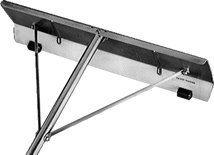 Roof Snow Rake - Old World Distributors, Inc. Please Disregard Shipping Errors. We Ship Everywhere. Shipped in 62" x 7" x 2" Box at 7 lbs. Blade - 7" x 24"